Wisdom of Life. : Proud to be an Indian. A year ago a footage emerged from a remote village in India . The video showed a young girl receiving surgery to separate her fingers, which were badly burned and fused together. Why did this operation make headlines around the world? The surgery was performed by a 7-year-old boy named Akrit Jaswal. Now 13 years old, Akrit has an IQ of 146 and is considered the smartest person his age in India a country of more than a billion people. Before Akrit could even speak, his parents say they knew he was special. After the surgery, Akrit was hailed as a medical genius in India . Neighbors and strangers flocked to him for advice and treatment. 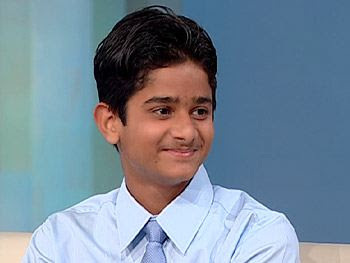 At age 11, Akrit was admitted to Punjab University . He's the youngest student ever to attend an Indian university. That same year, he was also invited to London 's famed Imperial College to exchange ideas with scientists on the cutting edge of medical research. Currently, Akrit is working toward a bachelor's degrees in zoology, botany and chemistry. Someday, he hopes to continue his studies at Harvard University .